I’m going to preface this post by saying, I don’t have all of the polishes for this collection. YET. * (I do now) So here’s the story. I ordered this collection, along with a few other polishes in Zoya’s Black Friday sale. 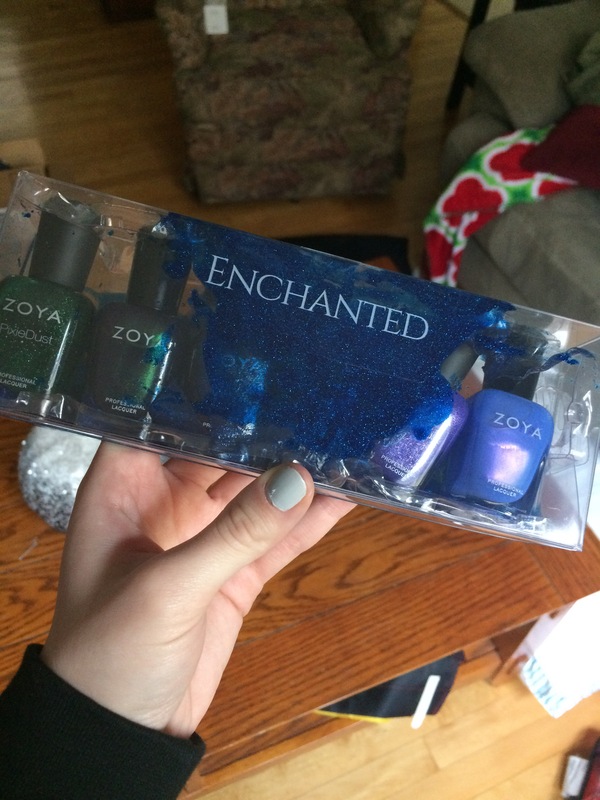 It shipped, it was delivered, I pulled the package out of the box, and… one of the polishes was smashed inside the package. Polish everywhere. I promptly cleaned it up, getting blue everywhere, and got right onto emailing customer service. Luckily they were so lovely, and immediately sent out another bottle of Waverly. I should have that by Friday, so I’ll be sure to update the post, and label it with Full collection when I truly have all 6. *UPDATE! I have them all now. Right away I emailed Zoya’s customer service. They were very lovely, and shipped out a replacement polish, and I got it within the week! I was very satisfied. So I have the full collection. In this collection there are 6 polishes, 2 duochromes, and 4 of Zoya’s ‘Pixiedust’ formula – aka textured polishes. I’ll start with the duochromes. The first is ‘Saint’. Saint is a soft, light blue base, with a purple-magenta shimmer running throughout that gives it a purple flash. Depending on your thickness of application it can take 2-3 coats. 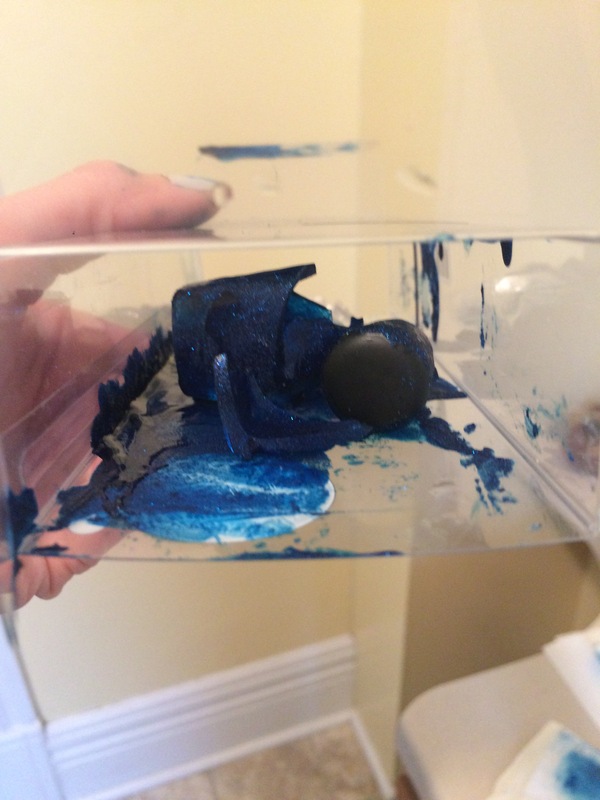 As you have add more coats, the base deepens to a more opaque blue. Beautiful smooth formula. I tried to catch the purple flash, but it’s a little more subtle. The purple flash is a little more apparent in the bottle. Up next is ‘Olivera’. This a super dark navy, almost black, base with a gorgeous green shimmer all throughout. You can get away with 1 coat, but adding another brightens the shimmer. The flash in this one is more apparent than in ‘Saint’ before. Another smooth, easy to control formula. As you can see around my cuticles, the dark base can stain a little bit. Just be careful with cleanup. Onto the PixieDusts! PixieDusts are Zoya’s version of a textured nail polish, so if you don’t like texture, these aren’t for you. These have a slightly smaller grit to them than the L’Oreal Gold Dust polishes. So it’s not super textured, but still definitely there. I found all of these had the same formula. I used 2 coats for each. The first coat was a little thinner, with a much thicker 2nd coat as the polish would sink into the first coat. Fully opaque in 2 coats. The formula is super smooth, and easy to work with. For removal, I just wet a cotton pad with acetone and laid it on my nails for a couple seconds and was then able to swipe them off pretty easily. Overall, these are lovely – if you love texture. Let’s get on to them! First is ‘Alice’. This is a light cool-toned purple with some silver and blue sparkles. Next is ‘Lorna’. This is a nice berry-wine color with fuchsia and silver sparkles. Next is ‘Elphie’. It’s a deep forest green base with green and silver sparkles. This reminds me of grinding up a Christmas tree and painting it on your nails. Is that weird? It’s so holiday. The last PixieDust is ‘Waverly’. This is the one that broke and leaked all over my dreams, but you know, it’s so beautiful I can’t be mad at it for long. 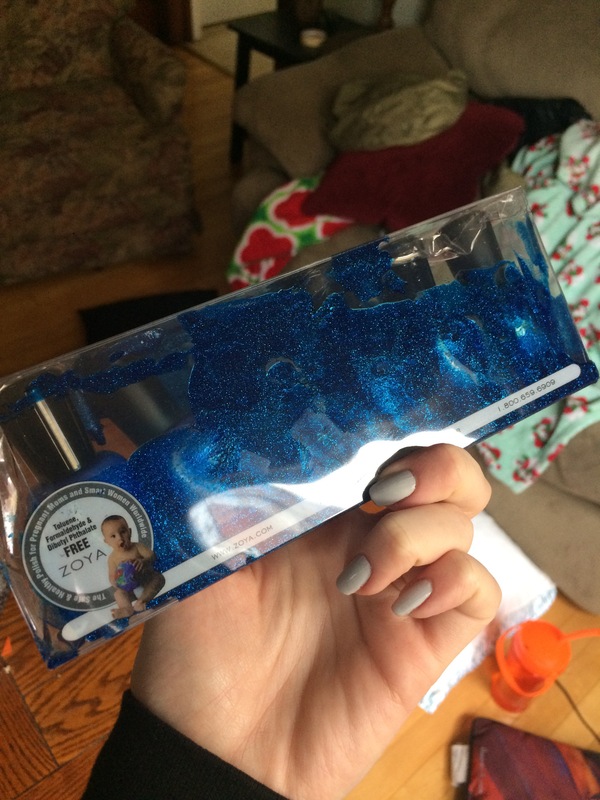 It’s a beautiful dark blue base, with dark blue and silver shimmers. Look at that beautiful, unbroken bottle. If you don’t like the texture, you can also always slap on a thick top coat on top of it, and really have the shimmer stand out. As always, Zoya’s polishes all have beautiful formulas. There’s really no negatives I can say about any of them. Overall, I have to say my standout favorite is ‘Olivera’. That green flash is just so beautiful. And the PixieDusts are always great if you love texture! They have so many different colors in that finish to choose from on their website. I’ll have swatches up of the other Zoyas I picked up in their Black Friday sale soon. What colors did you get from the sale? P.S. My finals are over! Which means I’m on Christmas break now! No responsibilities! This means I’m going to try to get as much content out as possible – stay tuned for all of the posts!